Features: 1989 Lions - Where are they now? Just under a quarter of a century on, the 1989 British & Irish Lions can be seen to have made a fair mark on the team's 125 year history. The 1980s had not been a great decade for the Lions. It began with a controversial, injury-hit trip to South Africa and a 3-1 beating in the Test series, followed in 1983 by a 4-0 whitewashing by the All Blacks. In 1986 came the belated realisation by the four Home Unions that tours to apartheid-era South Africa were neither acceptable nor practical and a cancellation. By 1989 it was six years - the longest gap since World War Two - since the Lions had toured. 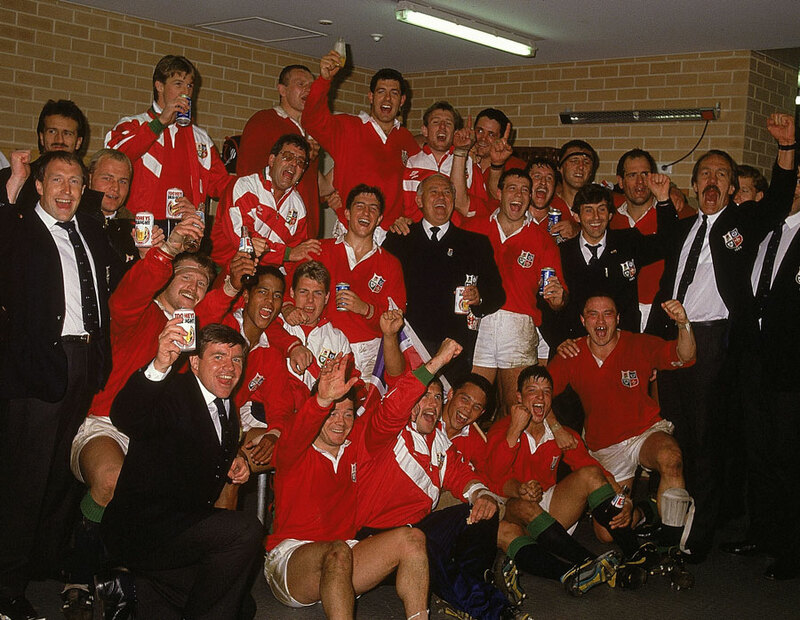 Fortunately, the rise of Australia during the decade had made it a practical freestanding destination for a Lions tour for the first time since the first decade of the century. The 1989 squad, led by Scottish flanker Finlay Calder initiated the current cycle of four-yearly Lions, joined since 1997 by a rehabilitated South Africa. They were also the first team to be coached by Ian McGeechan and seem - of all recent Lions squads - to have been the one to have found the most effective answer to the great challenge facing them all, keeping the players not in the test team committed and engaged. The credit for that delicate task goes to McGeechan, manager Clive Rowlands and perhaps most of all Irish lock Donal Lenihan, who gave the 'dirt-trackers' their own cheerful identity as 'Donal's Doughnuts'. Test scrum-half Robert Jones tells the story of his deputy Gary Armstrong triumphantly brandishing one of the T-shirts the Doughnuts had made for themselves and saying 'You'll never get one of these, Jonesy". Quite how much that mattered was evident a few days after the first Test, a 30-12 hammering in Sydney. The Doughnuts did more than just provide a huge lift to battered morale with a fine performance, beating Australian Capital Territory 41-25. They also offered the tour selectors live alternatives to the team humiliated in the first Test, and five Doughnuts were elevated to the Test team the following Saturday in Brisbane. The promotion of Rob Andrew, Jeremy Guscott, Mike Teague and Wade Dooley took the total number of England players in the starting XV to eight and inaugurating a long era of English dominance of Lions teams. Not until Welshmen predominated in the first Test in South Africa in 2009 would the Lions start a Test with more players from another country (although Wales would provide as many in the second and third tests, and Ireland in the third test, against New Zealand in 2005). It is the second Test which is generally recalled when this series is talked about, a brutal contest which took its cue from a brawl between the two scrum-halves, Robert Jones and Australian captain Nick Farr-Jones, at the first scrum. The Lions won 19-12. But it was the third Test, back in Sydney a week later, which ultimately determined how this team would be remembered. The Lions were able to field an unchanged team including a pack with an unyielding English core - Teague, Dooley, Paul Ackford, Brian Moore and Dean Richards. They kept Australia on limited rations of possession, but the Wallabies, typically, found a way to stay competitive and scored the first half's only try through pacy wing Ian Williams. It was 9-9 at half-time, with three penalties from Gavin Hastings providing all the Lions' points. Michael Lynagh kicked the Wallabies into a 12-9 lead early in the second half, and then came the pivotal moment. Andrew dropped for goal and the kicked drifted wide. 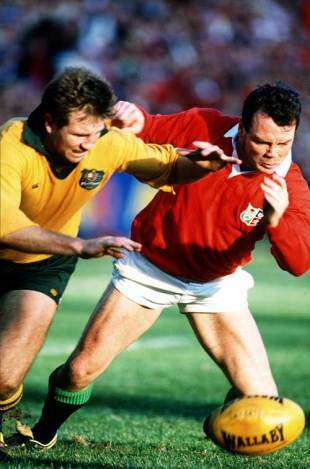 Australian wing David Campese, closely watched by opposite number Ieuan Evans, picked up. As Evans has recalled: "If it had been any other player, he would have dotted the ball down and gone for the obvious option of a drop-out. Obvious was the last word you would ever associate with David Campese." "Estimates as to how far I had to go to score that try vary. Resisting all temptation to stretch a point, I have to say that it was no less than six inches and no more than two feet." Campese chose to run, Evans pressurised him and he threw a pass in the general direction of fullback Greg Martin. The ball struck Martin on the shoulder and fell to ground near the Australian line. Evans remembered: "I couldn't believe my luck or my eyes. Estimates as to how far I had to go to score that try vary. Resisting all temptation to stretch a point, I have to say that it was no less than six inches and no more than two feet". Evans also admits in his memoirs to having given Campese, who had humiliated him earlier in the game with a sumptuous dummy, a post-touchdown volley of verbals, for which he apologised profusely post-match. The score, as Evans pointed out, proved "the value of chasing every ball, no matter how hopeless it may appear". He would prove that principle again four years later at Cardiff, this time at the expense of Rory Underwood, the other Lions wing in Sydney. Two more Hastings penalties gave the Lions a 19-12 lead, but they had to withstand a ferocious Australian comeback which brought two more Lynagh penalties to cut their advantage to a single point. In the dying seconds Australia attacked again from their own line when Robert Jones box-kicked and Williams launched the counter. "For a moment he had space out wide, we were struggling to get defenders across and I was thinking I'd kicked the series away in the last few seconds. To my immense relief Scott Hastings got across and put in a tackle, and soon afterwards the referee blew the whistle," Jones has recalled. Campese came in for a barrage of criticism so vehement that Farr-Jones was prompted to defend him in a letter to the Sydney Morning Herald. It concluded: "To Campo, I say ; Yes, one bad mistake on Saturday, which I know you will learn from, but, mate, if I was a selector you would always be one of the first picked, with no handcuffs or chains to inhibit you." As we know, Campese stuck to his unfettered style and Australia continued to pick him, almost invariably to their benefit, well into the 1990s, although acting without prior thought has perhaps served him less well in his post-retirement rent-a-quote incarnation. His error gave the 1989 Lions perhaps their most important achievements. Since 1910 seven Lions teams have gone into a final Test with the series undecided. Those of 1910, 1955, 1977, 1993 and 2001 lost (although in 1955 this meant a drawn rather than lost series). The 1971 team claimed perhaps the greatest prize of the lot with a series win over the All Blacks, but their final test was a 14-14 draw, not a victory. Of those seven teams only the men of 1989 have won their decider - at the same time becoming the only Lions team to win a series after losing the first Test.